With a genetic patch, Oozerm can metamorphose into Blobrog. It has remarkable vitality and adaptability. If it is faced with extremes in temperature, it can survive by producing excess slime which hardens into a protective cocoon that prevents it from being dried out or frozen. If need be, it can remain in his state for up to a year. Although it is somewhat lacking in raw power compared to other Kreatures of its rank, it can weaken its opponents by constricting them with its tail and draining their energy. It compensates for its lumbering frame with cunning opportunism, saving its strength until the exact moment to attack presents itself. 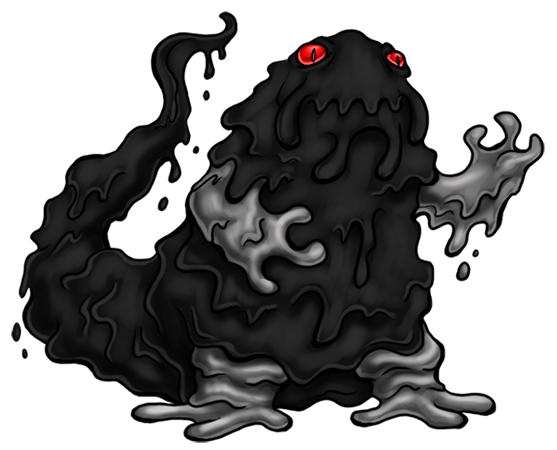 Updated Comment: Blobrog is a solid slime/blob monster. The grey arms and legs go perfectly with the black body and once again the eyes look great. Also I don’t know if this was intentional or not, but I really dig the barbel-like protrusions on its face.